Shop Talk is written by OM editor Dayanti Karunaratne and Sarah Fischer, OM account executive and fashion maven. Lift aims to provide durable, affordable clothing that wicks moisture away from the body of hard-working athletes of all levels. They seem to really emphasize the affordability of their shirts and the sleeves can certainly handle those biceps! Here, SHOP TALK catches up with Rania following the shoot. How did you find out about Lift? Through a friend . She knows I’m always looking for new brands — especially home-grown — and she introduced me to it in the hopes that I might use it for my next shoot. What kind of work do you do for Lift? I’m wardrobe stylist. My job is to seek clothing that is concept appropriate. I do not work specifically for Lift. One of the last shoots I did needed active wear. I decided to use Lift to promote it and showcase to Ottawa what we have locally. Tell us more about this project. 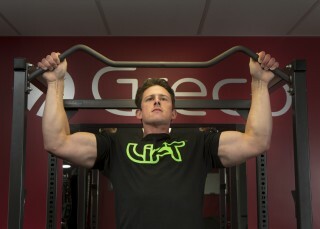 The images showcase a personal trainer acting out his gym routine to us in Lift clothing. He is showing us the comfort and flexibility, as well as the variety, of the line. Why do you think Lift is doing well in Ottawa? Lift is doing well in Ottawa because people are becoming more knowledgeable and aware of fitness and wellness. It’s a great market because so many Ottawans are involving themselves in physical activity and leading a healthy lifestyle. What did you learn through this shoot? Lift produces a variety of T-shirts and ball caps in multiple colours. Their products range from organic cotton to recyclable polyester, rayon from bamboo, and other eco-friendly fabrics. They are also pre-shrink for your convenience. Who would you want to tell about Lift? Lift is designed for a broad range of people: those just starting to become physically active, people who play sport-specific activities, and fitness freaks who already spend a lot of time at the gym. Lift is geared toward everyone.